This week's reading has been severely limited due to the flu, but please be sure to visit Amy at The Art of Irreverence who is hosting this week's round up. I posted this last year around this time when I was serving as a panelist on the Cybils Middle Grade/Young Adult Nonfiction Panel. Since I'm on the panel again this year, I thought I'd post it again to serve as a reminder for what I'm looking for when evaluating the nearly 50 books that have been nominated in this genre. Middle graders and young adults span from approximately age 9 to 14+. That's quite a wide age range, so as I'm reading, I'm asking myself if the subject matter as well as the language, visual elements, organization, and tone seem appropriate for the book's intended age. As a former middle school and high school teacher, I know that kids in this age group do not want to be treated like little children or feel as if they're being talked down to. Likewise, they don't like to read books with childish illustrations or large "baby" fonts. On the other side of the spectrum, I pay attention to whether or not the same elements may be more appropriate for older audiences. Layout is important when it comes to evaluating a book. A pet peeve of mine in nonfiction is when a sentence or paragraph carries over onto the next page, and you have to flip back to read an interesting text box, time line, or photo caption. If I have to turn a page so that I can finish reading a sentence and then have to flip back to read something else, I get annoyed, and I can imagine that kids may NOT flip back and miss interesting information. I know that this is sometimes out of the author's control and that it has to do with printing issues, but to me, good layout and content go hand in hand. What use is good content if it's missed or forgotten because it's poorly organized? On a similar note, I also look at how information is organized and chunked. Are section headings easy to find? Is the information organized so that it follows a logical flow and is appealing to the eye or do readers have to wade through lots of text or read tons of information and elements that are crowded onto the pages. To me, readability is just as important as engaging text. As I mentioned above, kids don't want to be talked down to, but at the same time, they don't want to read dull, dry text. As I'm reading the books, I take a close look at the writing style and tone and try to get a grasp on whether it's engaging and conversational. Does it draw readers in by asking questions or presenting problems that need to be solved? If it's a biography, does the author present the subject matter in a way that makes the person(s) appealing to readers? Can they relate to them? Are readers inspired to keep turning the page? Even though it's nonfiction, the book should still tell a story or stories that interest kids and keeps them from putting the book down. The story could be about Abraham Lincoln's assassination, a historian's quest to discover information about a legendary figure, or the story behind the formation of a new solar system. To me, excellent nonfiction doesn't just present straight facts. I can get that kind of information in an encyclopedia. Instead, excellent nonfiction draws me into a story about something or someone, inspires me to ask questions and want to discover the answers, and makes me CARE about the subject matter. I finally look at the visual elements in a book to help me distinguish the good from the great. Granted, some genres like biography or autobiography don't necessarily require a lot of photos or illustrations, but they certainly don't hurt. Or do they? Going back to age-appropriateness, visual elements CAN hurt a book's quality if they are too immature or even too mature for the intended audience. If I pick up a book about The Civil War that's written for a middle grade audience, I don't expect to see gory pictures of corpses strewn about a battle field. But I DO expect to see pictures of important people from this time period and perhaps some weapons or other relics. I tend to prefer nonfiction where the visual elements are integral parts of the book instead of supplementary elements. By that I mean, does the book merely include a drawing of a chapter's subject matter at the beginning of the chapter or are illustrations, photographs, maps, timelines, etc. scattered throughout? Are they colorful, crisp, easy to distinguish, and eye-catching? Do they have captions if appropriate? Can a reluctant reader pick the book up and be engaged without having to read all of the text? That's important to me. Does the book have a list of references at the end, an index, glossary, or a sources consulted section? Not only do references give you a place to go for more information, but it shows you where the author got his/her information. Moreover, it adds credibility to the content especially when the book has been reviewed by an expert(s) in the field of the book's subject matter. These criteria are really helping me focus on the different elements of the nominated books I've been reading and is helping me distinguish the good from the great. Anything I'm missing here? When John Wilkes Booth learned that Abraham Lincoln would be attending a play at Ford's Theatre on April 14, 1865, a theater Booth had virtually unlimited access to, he couldn't believe his luck. It was finally his chance to kill the president he abhorred, but he only had a few hours to make plans. And boy did he hatch a plan that also included the murder of Vice President Johnson and Secretary of State Seward. He quickly got his co-conspirators in position, planned his escape, and waited for the perfect moment to kill the president, a task he unfortunately completed. It's highly probable that most Americans know that John Wilkes Booth assassinated Abraham Lincoln at Ford's Theatre on April 14, 1865, but many don't know about the 12-day hunt for Booth through the Maryland and Virginia countrysides. James L. Swanson's Chasing Lincoln's Killer describes the events leading up to and after the assassination and greatly details his escape and eventual capture and death. Readers learn about the Confederate sympathizers who provided weapons, food, and shelter to Booth and his co-conspirator, David Herold, along the way; they learn about the investigation that led up to his capture; and they learn about the trials of the co-conspirators. Chasing Lincoln's Killer is what great nonfiction should be. It reads like a heart-pounding story with enough detail to give you an intimate picture of Booth, but it doesn't overwhelm you with facts and details that make a lot of nonfiction difficult to navigate. Photographs sprinkled throughout offer visuals of the main "characters" in the book and take you back to 1865. You almost forget that this really happened and that you're not reading a novel. This book is the YA adaptation of Swanson's Manhunt: The 12-Day Chase for Lincoln's Killer, and I'm eager to read it for even more detail. Chasing Lincoln's Killer is a Cybils nominee in the MG/YA Nonfiction category. Nonfiction Monday is hosted at Wrapped in Foil today. This week, we've been digging into some "older" books. Where the Wild Things Are by Maurice Sendak. Her daycare provider actually read this to her last week, and all I heard about on the way home was "Max this," and "Max that," and "Dancing with Wild Things and a 'Wumpus'." So, we've had to dig out our personal copy on the shelf and read it every single night. Honestly, it's hard to find a more perfectly-executed children's book, so it's been a joy reading it to her. We won't go see the movie because I think it may be a little too scary for her, but I think she'll enjoy it when she's a little older. The House in the Night by Susan Marie Swanson, illustrated by Beth Krommes. I'm only putting this book in the "older" category because we've had a copy since it was published in 2008, and we've read it numerous times. If you haven't checked out Caldecott Medal book, you're missing on on a real treat. The beautiful black and gold scratchboard illustrations perfectly complement the simple story. Here's a full review I wrote in June 2008. What are your children reading this week? Rebecca at Rebecca Reads is hosting this week's round-up, so stop by and let her know! Sara Zarr's latest young adult novel, Once Was Lost is a beautifully-written account of a teen girl's life-changing summer. Samara, called "Sam" by everyone, is the daughter of a small-town minister. The book begins almost a month after her alcoholic mother was sent to rehab after a DUI incident. Not only is Sam struggling with her mother's absence, but the family's finances will probably not allow her to return to her private high school at summer's end. On top of that, her father seems to be dealing with his wife's absence through denial...he doesn't talk to Sam about it at all and chooses to spend most of his time working at the church or helping other families with their problems. When a young girl from the church mysteriously disappears, the community is sent into upheaval, and Sam truly begins to question the faith and beliefs she's held close her entire life. To say Once Was Lost is about faith or alcoholism or Sam's "coming-of-age" or a young girl's kidnapping is just too simple because Sara Zarr's writing and story weaving is just too complex for that. It's about all of those things and more, but it's not an "issues" book. It's more about a girl's struggle with and acceptance of identity, and all of the other stories and incidents contribute to her journey. If you've read Zarr's other two novels, Sweethearts, and Story of a Girl, you're familiar with her exceptional ability to not only tell a gripping and compelling story but to really get inside the heads of the main characters and make them real. It was the same with Once Was Lost. From the get-go, you really care about Sam. She's a REAL teen who is struggling with some REAL issues. You can feel the sadness, anxiety, and suspicion grow amongst the residents of the town as each day passes with no sign from the missing girl, Jody. You can feel Sam's pain as she tries to deal with her mother's absence and her father's denial, and you can feel her uncertainty and "cautious optimism" when a boy seems to like her. As with her other books, you really don't know how it's going to turn out until the very end, and even then, the future for the main characters is wide open. Sara Zarr has fast become one of my favorite authors of realistic fiction. Once Was Lost comes with my highest recommendation. Brimful Curiosities is hosting this week's What My Children Are Reading. Head on over to submit your link and to see what everyone's reading! I'm excited that two finalists: Charles and Emma: The Darwins' Leap of Faith and Claudette Colvin: Twice Toward Justice are nominees in the Cybils Nonfiction MG/YA Category, the category in which I'm serving as a Round 1 panelist. By the way, tomorrow (October 15) is the last day in which you can submit nominations, so head on over to the Cybils site and nominate your favorite books ASAP if you haven't already! For more information about the nominated books and to see the nominees in other categories, visit National Book Foundation. If you've been browsing children's literature blogs and other book blogs, you've probably noticed a lot of recent posts about Betsy-Tacy, the classic series by Maud Hart Lovelace. That's because the series has been reissued and Betsy and Tacy have been on tour. I'm excited to be taking part in the tour because I enjoyed the books when I was a child, and it was quite a treat to be reintroduced to the characters and the small town Deep Valley, Minnesota. Even though Maud Hart Lovelace began writing the books in the 1930's, children will identify with the friends Betsy, Tacy, and Tib as they deal with real-life issues. In the books, we see the characters grow up from the time they are five through high school to the time of Betsy's wedding. For this blog tour, I am focusing on books three and four: Betsy and Tacy Go Over the Big Hill and Betsy and Tacy Go Downtown. The girls are getting older (10 in book three), and wheras the first two books featured vignettes of sorts of Betsy, Tacy, and Tib, books three and four have more of a plot as the girls begin to venture out of the comfort of their homes. In Betsy and Tacy Go Over the Big Hill, the girls go to "Little Syria," a community of Lebanese immigrants. It's here that the girls make new friends and develop an appreciation for what it means to be American and have freedoms like the freedom of religion. But interwoven among this theme are lighthearted episodes that will certainly appeal to children and keep them reading. For example, they fall in love with the King of Spain and have an argument with Betsy and Tacy's big sisters about who will be the Queen of Summer. In Betsy and Tacy Go Downtown, the girls are now twelve, grown-up enough to have even more adventures. This book is a book of "firsts" for the girls. They go the theatre for the first time, ride in a car for the first time, and discover how wonders of the new Carnegie Library. This really struck home with me because the library was one of my favorite places when I was a child. I also identified with this book growing up because the girls befriend the new kid in town. I moved to a new town and school when I was 10. This is a great book as the girls transition into young adulthood. Maud Hart Lovelace's work with setting and characterization is outstanding. You grow to love the characters and their hometown. As I was reading, I felt as if I lived in Deep Valley, even though I've never even been to Minnesota. I would not hesitate to give these books to children who love realistic fiction. Check out the other tour stops this week! Betsy-Tacy Book Relaunch Parties are happening across the country. Is one coming to your area? Thanks to TLC Book Tours for setting up the tour and Harper Collins for providing review copies of the books. Using random.org to randomly draw a number, Megan is the winner! Congratulations!!! I will e-mail you for your address! We've been a little "off" this week with reading. My daughter has been much more interested in playing with some new puzzles and doing crafts on her new craft table than reading. We have managed to sneak in a few books though. It's weird how this book sits on the shelf for weeks at time, and then suddenly, my daughter will pick it up and beg to have it read to her over and over again. I've read this to her since she was a tiny baby, so she knows most of the words by heart. 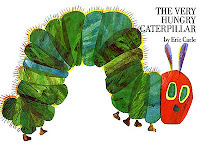 She asked me this week if we could go to the store and buy everything the caterpillar eats in the book. That would be fun, but I'd have to figure out how to make meals out of such a wide array of food. Sausage cupcakes? We picked this up at the library because my daughter is fascinated by construction sites and big machines. The text is a little too complex, but she's fascinated at all of the illustrations. I certainly learned a lot by reading this book! I certainly never knew all of the terms for all of those "machine-thingys." So, what are your children reading this week? Tanya Dennis at In the Dailies is hosting today, so be sure to stop by and leave your link! Happy Nonfiction Monday! It's been quite a while since I've done a Nonfiction Monday post because I haven't had a lot of time to scour the library for good finds. Thankfully, I've recently received some great selections in the mail, and as a panelist in the Cybils MG/YA Nonfiction category, I hope to be bringing you some great selections for middle graders and teens very soon. By the way, if you haven't nominated your favorite titles, do stop by the Cybils website by October 15 and do so. 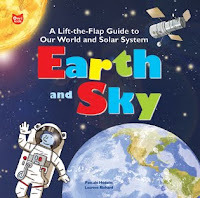 Earth and Sky by Pascale Hédelin, illustrated by Laurent Richard arrived in the mail from Owlkids just this week, and it provides a wonderful and interactive introduction to the Earth and our solar system. With basic information about everything from erosion to volcanos to constellations to the International Space Station, Earth and Sky presents digestible chunks of information perfect for curious learners. What makes the book unique and what will appeal to young learners are the interactive elements on nearly every spread. You can lift flaps, pull tabs, and even move the Earth around the sun to learn more about the featured topics. A page about the moon features a large illustration of the moon with indentations, allowing readers to feel the moon's craters, seas, and plains. Pascale Hédelin did a great job of choosing just the right amount of interesting information to present, and Laurent Richard's illustrations provide an engaging and fun reading experience. This would make a great supplement to a home, classroom, or homeschool library. Visit Moms Inspire Learning for more great nonfiction selections! Ballad: A Gathering of Faerie is the sequel to Lament: The Faerie Queen's Deception. (my review here) The book picks up where Lament left off. James and Dee are at the music school Thornking-Ash, and it seems as if they cannot escape the devious and murderous fey that nearly killed James in Lament. Ballad is told from the point of view of James, and I think Maggie Stiefvater made a smart choice in doing this because get an up-close-and-personal look into the mind of a wonderful character. Not only is James being tormented by his near-death experience and love for Dee, but he can't help but feel himself getting attracted to Nuala, a homicidal faerie who can only gain strength by sucking the life out of talented humans, and James is her target. But something is different this time. Nuala develops feelings for James, and as Halloween approaches, James is forced to choose between the lives of Nuala and Dee. As I've come to expect with Maggie Stiefvater's works, Ballad is beautifully written. The plot is fast-paced and heart-pounding up to the end, and Stiefvater has a way for making you truly care for all of the characters you're supposed to care for, even the minor characters like James' roommate Paul and the English teacher Mr. Sullivan. Dee is more of a minor character in this book, and we mostly see how she is dealing with the absence of Luke (the homicidal faerie SHE fell in love with in Lament) through unsent text messages to James that are scattered throughout the book. I especially loved Nuala's character and loved the sections that were told from her point of view. She's lovable, feisty, and of course, a little evil, and Stiefvater did an exceptional job of illustrating the change in Nuala throughout the book. Fans of Lament will NOT be disappointed with Ballad. Check out the book trailer Maggie Stiefvater created. Age Range: Young Adult | Flux, October 1, 2009 | Source of book: Review copy from publisher. Happy October! Here on the East coast, it's my favorite time of the year, and this week, Autumn has finally made an appearance. The crisp chill in the air, the beautiful red, orange, and yellow leaves on the trees, and the sweet tang of hot apple cider brings back so many wonderful memories of my childhood in Southwest Virginia. My daughter seems to be catching "Fall Fever" as well, and this year, she seems to be much more aware of the change in season and the pumpkin, scarecrow, and Halloween decorations. In fact, she's a bit obsessed with pumpkins, which is why I was so happy to receive copies of the two new books in National Geographic Kids' "Picture the Seasons" series. Seed, Sprout, Pumpkin, Pie by Jill Esbaum takes kids on a journey of the pumpkin from seed to table. It even talks about other uses for pumpkins like turning giant pumpkins into boats, making jack-o-lanterns, and using leftover pumpkins for animal feed or fertilizer. Gorgeous photographs are the showpiece of this book, and the simple, sparse text make it a perfect read for beginning readers. Since this book arrived last week, my little girl has asked me to read the "Pumpkin Book" over and over, and earlier this week, she instructed me to "go buy the biggest big big pumpkins in the world and make jack-o-face lanterns." Apples for Everyone, also by Jill Esbaum, follows a similar format to Seed, Sprout, Pumpkin, Pie. It takes you on the apple's journey from seed to table and shows all of the ways apples can be enjoyed from cider to caramel apples. The photographs are beautiful AND delicious. I can see these books being used in preschool classrooms and early elementary classrooms to supplement lessons about the fall, plant development, fruits and vegetables, and more. Combine them with National Geographic Kids' A Tree for All Seasons and Pilgrims of Plymouth for a well-rounded introduction to the fall season. In Need of Chocolate is hosting today's round-up. Be sure to visit and share what your children are reading!